Looking for a little light-hearted adventure this weekend? Check out Quantum Conundrum, a puzzle game that you can buy on Steam right now for less than twenty bucks. The premise for your puzzle-solving is a high-tech Victorian house haunted by the disembodied voice of Dr. Quadwrangle, a curmudgeonly scientist trapped in a pocket dimension who needs your help. To free him you’ll need to strap into the sneakers of his precocious nephew and navigate through the malfunctioning mansion by dodging deadly lasers, leaping impassable chasms and traveling to alternate dimensions while your omniscient uncle offers hints and pokes fun at your progress (or lack thereof). Did you play Portal? Then let’s get one thing clear up front: Quantum Conundrum is very, very similar to Portal. Expect to spend 6-8 hours progressing through a series of locked rooms, solving puzzles of increasing complexity by manipulating physics with a futuristic gadget strapped to your arm. The striking similarity might reflect the fact that Kim Swift, lead designer of Quantum Conundrum, was also lead designer of the original Portal. 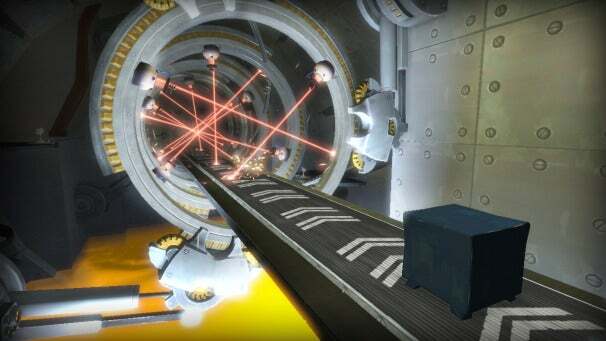 Swift left Valve Software before Portal 2 was released to join Airtight Games and work on Quantum Conundrum, so it’s feasible that fans of Portal might embrace Quantum Conundrum as that games’ spiritual successor. I think it’s more likely that Quantum Conundrum is remarkably similar to Portal because physics-based puzzle games are fun, and people enjoy making and playing them. Quantum Conundrum lends credence to this theory by being pretty fun to play, especially if you enjoy the sort of humor that crops up in a Dreamworks animated movie. While Quantum Conundrum's puerile protagonist actually remains mute throughout the game, the disembodied voice of Dr. Quadwrangle (voiced by Star Trek and Planescape: Torment alum John de Lancie) keeps up a running commentary on your performance and provides entertaining insights on the history of Quadwrangle Manor. The game never takes itself terribly seriously, which makes it ideal for short play sessions but a little unsatisfying to complete; all the jokes and visual gags feel like window dressing for a mildly challenging puzzle game. Quantum Conundrum never really explains why you should care about the fictional Quadwrangle family or their fantastic estate, but it blatantly challenges you to play through puzzle rooms multiple times by scattering collectibles throughout the game, measuring your performance against your friends via online leaderboards, and placing a big honking "Level Select" machine smack dab in the foyer of Quadwrangle Manor. Thankfully, the puzzles are a blast to solve. The design of the puzzle rooms encourages you to play with the Quadwrangle estate in unexpected ways; by quantum shifting between alternate dimensions that make everything (except you) lighter or heavier, reverse gravity or slow down time by a factor of ten, you'll quickly start solving seemingly impossible conundrums by making cardboard heavy enough to stop lasers, slowing down time enough to play catch with yourself, or rapidly reversing gravity back and forth to surf through the air on a flying sofa. The puzzle rooms get more complex as the game progresses, but I never felt frustrated; in fact, I often found myself grinning after discovering a solution to a seemingly impassable puzzle. None of these puzzles are likely to stump you for more than five or ten minutes, but if you finish Quantum Conundrum and still want more you can go back and replay levels to try and beat your best time or solve a puzzle with as few quantum shifts as possible. Your performance is broadcast to your friends via the afore-mentioned online leaderboards, and going forward more puzzles or multiplayer modes may be released for Quantum Conundrum as downloadable content. Hopefully Airtight Games will also release some DLC that fleshes out the story of Dr. Quadwrangle and his errant nephew; after completing the game on PC I was a little disappointed with the lackluster ending, but thoroughly enjoyed the seven hours I spent solving the riddles of Quadwrangle Manor. I think you will too. You can download Quantum Conundrum on Steam right now, or wait and download it on Xbox 360 and Playstation 3 next month.